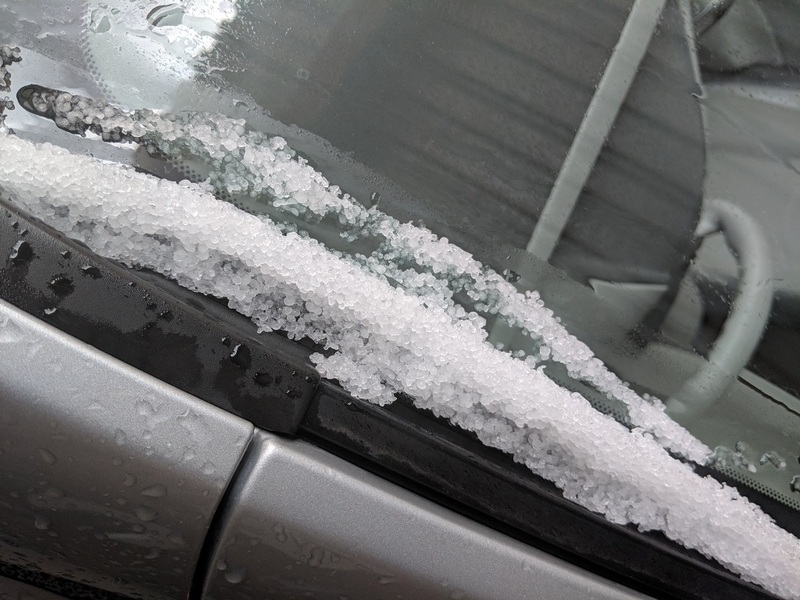 An area of moderate to heavy showers moved across northern parts of the City around 8:30 am MST - the rain was mixed with graupel, as per images below. 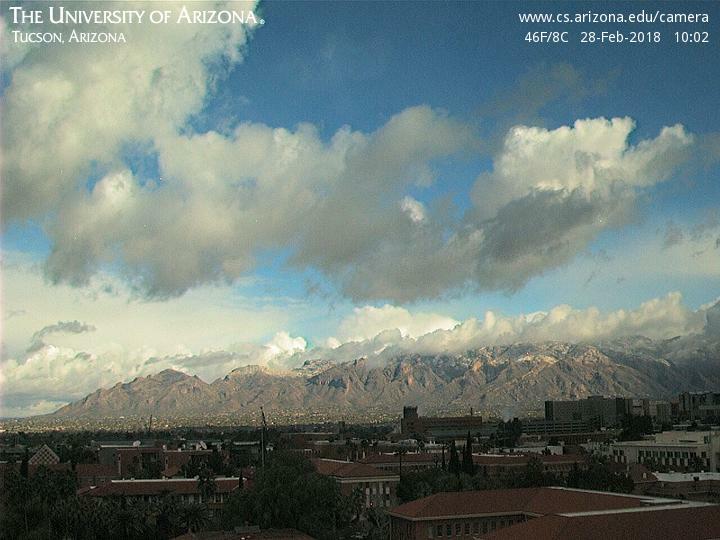 Also some snow on the Catalinas down to about 4,000 ft msl - bottom. There has been several inches of snow up at Summerhaven - as per General Store image above. Sun is peeking out some here (bottom) and the early morning rains fell essentially from 2:00 am to 5:00 am MST - 0.22" in gauge here at house. The airport had 0.20" and DM AFB had 0.28". I have just checked and the monthly total for February here (1.80" so far) is greater than any month since August 2016 - except for our very wet July of 2017. Morning rainfall observations for the event shown here - above at 6:00 am from the ALERT network and below at 7:00 am from MesoWest (Univ. of Utah). The ensemble forecasts shown in the past several posts verified quite well for this event - widespread rain with low elevation amounts generally around a tenth to a quarter of an inch. Nice view of alto-cumulus over the Catalinas at 7:20 am MST this morning. The 500 mb analysis for 12 UTC (above, from SPC) shows the closed low centered along the California coast north of Vandenberg AFB. Temperatures are very cold with the system, although it is not going to dig as far south as some earlier forecasts indicated. The 500 mb forecast below is from the 06 UTC run of the WRF-GFS at Atmo and is valid at 6:00 am tomorrow morning. 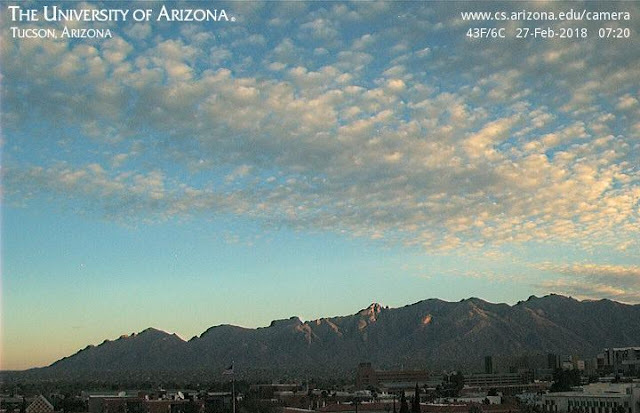 By that time the model forecasts the system to have opened-up, warmed, and sheared to northeast, bringing a positively-tilted trough across Arizona during the night. The 09 UTC SREF plumes from SPC forecast of QPF for TUS is shown below. The ensemble average (black) remains at less than 2/10s of an inch, with considerable spread. The system is definitely moisture starved and the 06 UTC WRF-GFS forecast for Tucson now indicates only a Trace at the airport - a distinct drying trend from earlier WRF forecasts. The WRF now forecasts an event that mostly impacts higher elevations, and it's a tough call to guess how much will be in the low-elevation gauges by mid-day tomorrow. The global model forecasts continue very similar to yesterday's runs, and I've taken a quick look at the 06 UTC forecasts from the WRF-GFS this morning. Temperatures here the last six mornings have been quite cold; ranging 26 to 30 F after three weeks of milder morning lows. 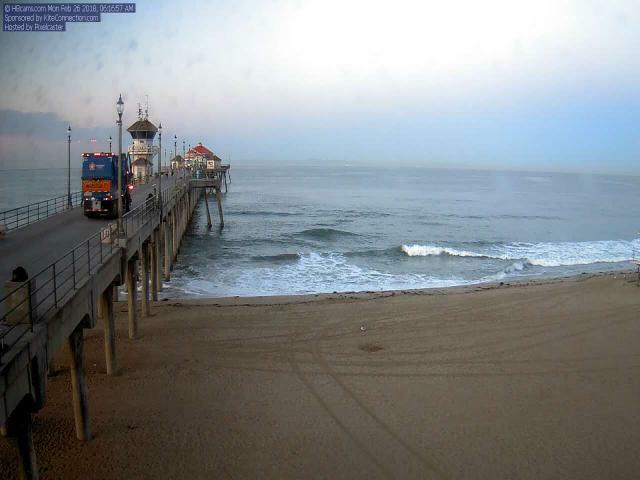 Photo at bottom (from Jack Hales webcam wall) shows the pier at Huntington Beach, California, this morning. I was surprised at the size of the bus out on the pier. The forecasts here are for tomorrow night's event. Above is forecast of composite radar echoes valid at 10:00 pm MST tomorrow night, while below is forecast of total precipitation through noon on Wednesday. Bottom is for same period but is forecast of snowfall. We've been away to Santa Rita Abbey last two and just a quick report today. This morning was coldest so far in February with a low of 26 F. It was very cold yesterday morning in the Sonoita area and low at Abbey was estimated by me to have been 16 -19 F with light but hard frost that lasted past 9:00 am MST. Photo above shows Mt. Wrightson with no visible snow cover - unusual situation for this time of year. Fast moving system will move across Arizona Tuesday and Tuesday night - above is 00 UTC ECMWF 500 mb forecast valid at 5:00 pm on Tuesday afternoon. This short wave is forecast to be quickly off into the Plains and to bring winds Tuesday afternoon and then good chance for light showers Tuesday night. Have only taken look at the 06 UTC GEFS plumes this morning. Very tight agreement among the members - 100 % chance of light rain at airport on Tuesday night the average forecast being a bit less than 2/10s of an inch (heavy black line above). Looks to be another moisture-starved event (see PW plumes just below), but good chance to add a bit to February totals. The 10-m wind plumes at bottom forecast the stronger winds for Tuesday afternoon. Some final February interest though. Even though large-scale trough remains over the West, it appears that main impacts locally will continue to be chilly temperatures and several windy periods for rest of February. Graphics here are all from 00 UTC runs of global models and are valid at 00 UTC on March 1st. There is reasonable consistency in the GEFS 500 mb mean and spaghetti plots (above) . The most uncertainty at that time for CONUS U.S is over the west half of country. But real heaping amounts of spaghetti are piled over the North Atlantic and Europe. Three of the GEFS member forecasts, plus the operational GFS, are shown below, with the operational GFS at upper left. The details of the western short waves have fairly large differences. The most interesting for us is the forecast at lower left, which is trying to dig a short wave over the ocean, rather than keeping things mostly over land. This would increase chance for a moist system during first week of March. The operational ECMWF forecast (at bottom) appears fairly similar to the bottom right forecast from the GEFS. The ECMWF also looks promising wrt digging a short wave over the ocean. We will wait to see whether March starts out wet. View from campus at a bit after 7:00 am MST this morning - note temperature of 39F. Here at house the low this morning was 29F - the first morning of February with a low of freezing or below. Shown here are the 72-hour 500 mb forecasts from 00 UTC last evening that are valid at 5:00 pm Friday afternoon - GFS above and ECMWF below. Both forecasts are similar, with a significant short wave crossing Arizona again. This weather system will bring strong winds again to Arizona. However, it will be another moisture-starved system, with light showers or sprinkles likely across the metro area. Yesterday produced light showers across the metro area (ALERT 24-hour precipitation at 7:00 am MST this morning - below) late evening with a few spots getting a second round after midnight. Amounts were were mostly below 2/10 inch except in mountains. Here at house we had 0.06". Coverage was impressive with 90 to 100% of the network receiving measurable precipitation and some snow at highest elevations. Winds were very strong across most of state with gusts of 35 to 45 mph common. Highest winds I noted this am were above 50 mp and included: 70 mph at 4-m telescope on Kitt Peak; Guthrie RAWS 64 mph; Winslow 63 mph; and Flagstaff 55 mph. 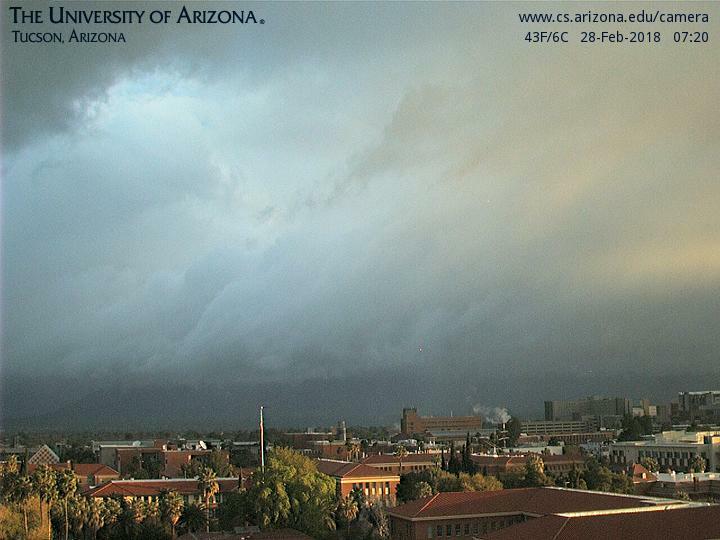 A very unsettled day in store for Arizona today. 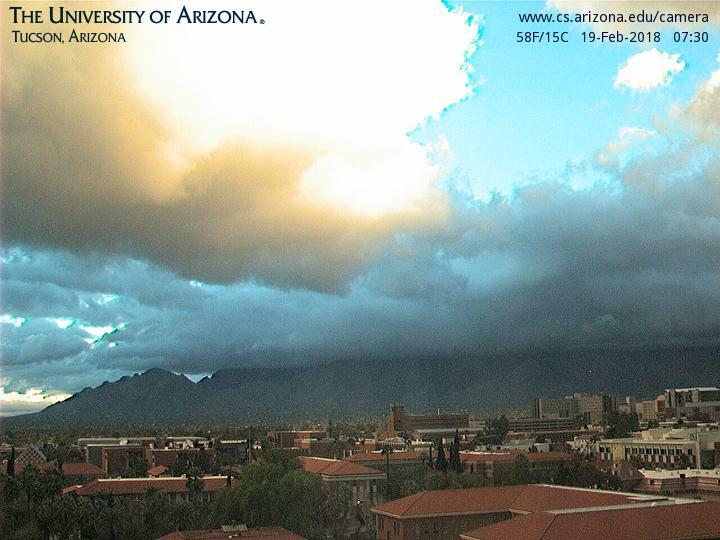 At sunrise heavy clouds (from bright to dark) hung over the Catalinas. The 06 UTC GEFS plumes from yesterday (above) for local PW were a total bust, and PW remained about constant through the day and night - as per GPS PW time-series from campus below that has end time of ~ 12 UTC this morning. The MIMIC TPW analysis for 13 UTC (second below) indicates higher PW values continuing over south-central Arizona, ahead of strong cold front that will cross state today. Yesterdays showers produced some measurable precipitation over the mountains and parts of the metro area. Afternoon showers here produced 0.01". I noted 0.33" at Pioneer Airfield. Very strong and cold 500 mb short-wave trough will be moving into Arizona by noon today (above from 06 UTC WRF-GFS on 5.4 km grid last). Ahead of the associated cold front there will be strong winds (below 06 UTC WRF-GFS 10-m winds forecast for 2:00 pm MST on 1.8 km grid). Note the very strong winds forecast on the down-wind side of many mountain ranges (i.e., purple shades). This early morning winds are gusting over 50 mph and some locations in norther and eastern Arizona. With the front and residual moisture approaching there will continue to be showers around, although the WRF-GFS forecast keeps measurable amounts mostly on mountains and east of Tucson. 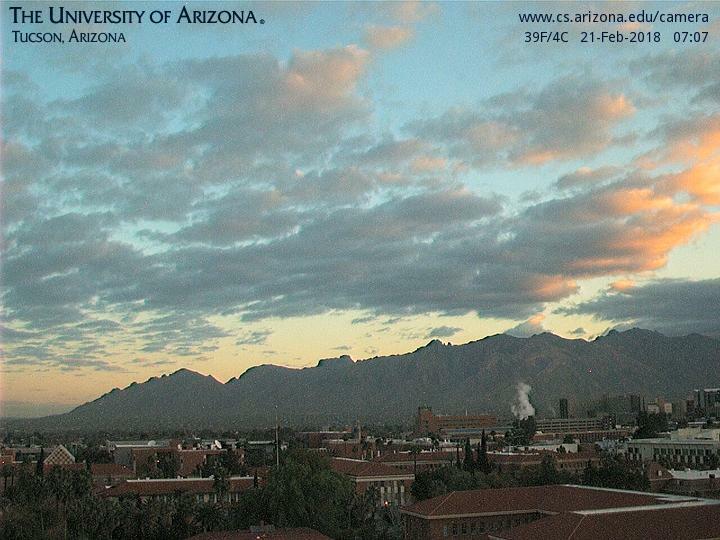 Nice start to day on Sunday morning, as per view to north from campus. There does appear to be a shallow layer of grunge hanging along the foothills. Stong 500 mb short-wave is forecast to dig south-southeastward toward Arizona during next 60-hours (above is ECMWF forecast from 00 UTC 18 Feb is valid at 00 UTC on the 21st). However, the GEFS plumes from 06 UTC for PW at TUS (below) indicate that PW will plunge from high values this morning to very low values by the 21st. This would mean more moisture-starved weather systems for rest of month. However, the MIMIC TPW analysis from 7:00 am MST this morning (above) offers a bit of hope for next 48-hours, as higher PW seems to be curling northward west of northern Baja - indicating that the falling PW maybe overdone for next 36-hours (worth watching to see how the GEFS forecast PW plays out). Below is 06 UTC WRF-GFS forecast from Atmo for total precipitation through 5:00 pm tomorrow afternoon. This forecast is certainly moisture-starved except at higher elevations. I have found that even though the operational GFS is run at approximately 13 km resolution, the GEFS ensemble members are run at half a degree (~54 km), I assume that this is because of computing time constraints. I have not been able to determine whether the physics packages are exactly the same. Regardless, the operational GFS has higher resolution and thus captures terrain gradients better than the GEFS. Further, the GEFS does no interpolation and assigns the nearest grid value to TUS. The map below was provided by Mike Crimmins back when we were first hashing around this issue. 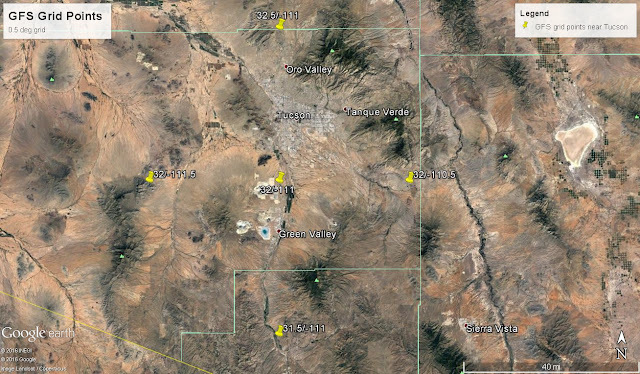 The grid map for the GEFS ensemble members for Arizona (below - provided by Tracey Dorian of NWS EMC) shows the location of TUS as a red triangle. Map at bottom also shows this point. The grid point is exactly the same as the one south of airport as provided by Mike. The distance between the closest grid point and the airport is about 15 km and the grid point surface elevation is about 136 ft higher than the ASOS site at airport. 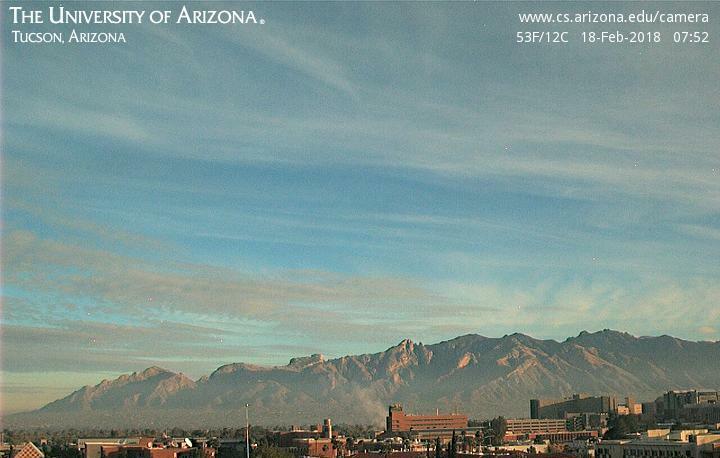 So there is only a small amount of upslope or downslope missing from the GEFS plumes for Tucson.